In articles about the work of Jeroen de Rijke and Willem de Rooij, comparisons with various painters figure prominently. Critics certainly cannot complain that their films are lacking in painterly associations - from Saenredam to Caspar David Friedrich. Of course, it is not especially remarkable in contemporary art to find a photographer alluding to painting, a video artist using photographs or a painter drawing on the characteristics of the film or video image: the modernist injunction that artists should use a medium ‘purely’ has long since lost its force. The trouble with comparisons of work in other media with painting is that they can all too easily become a cunning ideological ploy to confer a higher status and greater value on the work in question. For large sections of the art world, painting is after all still the most privileged medium, and invoking the great history of painting is still an effective prestige- and price-enhancing strategy. Which is not to say that there should be an embargo on such comparisons: they are sometimes inevitable. It is, however, important to ensure that they are not misused apodictically to halt reflection instead of mobilizing it. The films of De Rijke / De Rooij are in any case much more complex in their references and connotations. De Rijke and De Rooij’s most recent films consist of ten-minute-long, static takes. Of Three Men (1998) shows a group of men in a church-turned-mosque where the Saenredam association is indeed inevitable; their latest film, Bantar Gebang, that is being premiered at Bureau Amsterdam, shows a shanty town on a vast rubbish dump near Jakarta. The film begins when it is still half-dark but within ten minutes day has broken, with astonishing rapidity. At the centre of the picture is the entrance to the walled shanty town; a number of roads intersect here and every now and then people come walking along them. For the rest, there are a few doves fluttering about and a couple of combative hens strutting to and fro; that is more or less what Bantar Gebang entails in the way of ‘action’. The viewer has plenty of time to take in the structure and details of the picture and to observe the changing light. The slightly dreamy atmosphere of the beginning is dissipated by the breaking day. De Rijke and De Rooij’s previous films, such as Chun Tian (1994) and Forever and Ever (1995), did not yet consist of a single, unbroken shot. Chun Tian shows, in a few takes, a flowering garden with a Chinese couple; the Chinese declarations of love are subtitled in English, but the subtitles appear too late or too soon, raising doubts as to whether they do in fact belong with those Chinese sentences. Forever and Ever, which was shot in India, alludes to Bollywood melodramas, but De Rijke and De Rooij present scenes that have no clear, conventional narrative relationship with one another. De Rijke and De Rooij did not study the work of filmmakers like Godard and Antonioni until later on, but the way the conventions of cinema are ‘denaturalized’ by alienating interventions in these films is highly reminiscent of the strategies of nouvelle vague and related tendencies of the 1960s and 70s. As a result, these films, although obviously intended as a critical alternative to the current mainstream film, seem more like backward-looking pretentiousness than a serious attempt by the artists to position themselves within or in opposition to the contemporary image culture. The recent works of De Rijke / De Rooij are much more to the point, even though at first glance they appear to belong still less to the present time: it is difficult to think of a greater contrast with contemporary Hollywood films, say, than Of Three Men or Bantar Gebang. Instead of sensationalism and special effects, De Rijke / De Rooij present quiet images that invite careful study. The decision to use one continuous shot seems moreover to be a kind of primitivism. In a sense, they are returning to the early days of film, when the Lumière brothers aimed a more or less stationary camera at a factory gate (through which workers were emerging) or a railway platform (where a train was arriving). But the primitivism of Of Three Men and Bantar Gebang (which is conceptual only; technically the films are immaculate) acquires a topical dimension when it is related to the static recording of a specific place by webcams and security cameras. It is possible to see De Rijke / De Rooij’s recent films as visually richer, aestheticized versions of such contemporary ‘primitive’ images. In the 1960s, the Lumière brothers were regarded as early ‘documentary makers’, as the precursors of the ‘cinéma vérité’ that brought a realistic film practice into play against the Hollywood dream factory; the latest, present-day incarnation of this tendency has been dubbed DV Realism by Lev Manovich.1 The Dogma films and Mike Figgis’s latest film, Timecode, are examples of DV Realism, in that they avail themselves of the possibilities offered by digital video equipment of, without big studio involvement, making films that have an immediate, realistic impact. But, of course, these are proper feature films, not documentaries; recently it has even been argued that the Lumières were not documentary makers at all, but instead, using the means available to them, made cinematic fictions, staged situations and told simple stories.2 De Rijke / De Rooij indulge in mise-en-scène, too: the men in Of Three Men are placed in a mosque and the building is then carefully spotlit so as to produce a beautiful composition, while the choice of the entrance to the shanty town in Bantar Gebang implies a clear decision as to what will ‘happen’ in the picture. Whereas security cameras and webcams profess to show reality directly, De Rijke / De Rooij use the current obsession with ‘direct’, ‘unmediated’ images to demonstrate that there is no such thing as an image without illusion, without fiction, that images are always based on choices and are the projection planes for desires and obsessions. The security camera shows places deemed dangerous or vulnerable, where it is thought that crimes may be committed; the webcam shows places (a domestic interior, a city square) that acquire an illusion of interest by the sheer fact of having a camera pointed at them. In spite of appearances to the contrary, therefore, the place (the ‘reality’) does not underpin the image, rather the place only becomes interesting when it becomes image (because a camera is trained on it). The 35 mm picture of Bantar Gebang, that with its wealth of structures and details is so much more interesting than webcam pictures, underlines this mechanism. The place has become image, cinematic fiction. What Alfred Hitchcock was really dreaming of when he made the film Rope (1948), was an experimental film consisting of one continuous (unedited) take. Because of the maximum length of a reel of film (ten minutes, a limitation that still applies today) Hitchcock was forced to cheat: the film contains ‘concealed’ cuts, whereby, for example, someone in a black jacket goes and stands in front of the camera and when he moves on a new reel has started.3 As a matter of fact, Of Three Men begins in a similar fashion: the screen is black because there are evidently people standing in front of the lens, and when they move away, the picture appears. For Timecode Mike Figgis was able to make use of the long recording time made possible by modern digital video equipment: the four images that make up the split-screen picture are genuine continuous shots without cuts. Because they work with film, De Rijke and De Rooij have to contend with the same limitation as Hitchcock: ten minutes is all there is and they opt to observe that maximum time without resorting to ‘covert montage’. In so doing they once again distance themselves from the current video realism, since the ten-minute limitation strikes people as artificial nowadays and detracts from the illusion of reality conjured up by the absence of montage. So in this way, too, De Rijke / De Rooij sabotage the rhetoric of authenticity emanating from webcams. But has montage really been eliminated from recent films? In addition to conventional montage, the piecing together of separate shots in serial form, film theory sometimes refers to another form of montage, one that is not diachronic but synchronic: the simultaneous montage of elements within a single image.4 The church in Of Three Men, for example, is now a mosque, and Muslims sit in the Saenredam picture. 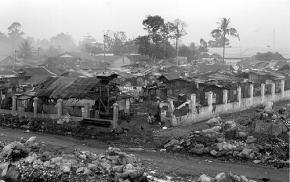 Bantar Gebang shows a combination of housing estate and rubbish dump, an unacceptable ‘montage’ by Dutch standards. Initially De Rijke and De Rooij looked for a spot where a shanty town (in the foreground) and upmarket apartment buildings (in the background) could be combined in the same image; they recalled similar rhetorical images from photo reports on Third World poverty. In the end they abandoned this plan, but it does say something about the way they integrate montage into the image. In this respect they differ from many other contemporary film and video artists who opt for less layered pictures. The works of De Rijke and De Rooij are the counter-images of the pictures that dominate the media. And precisely because of this, they are in danger of being too much at home in the museum, like certain Dutch painters, who are a fixture of the domestic museum circuit but whose work has no further relevance whatsoever for contemporary culture. The work of De Rijke and De Rooij, by contrast, could also be exhibited in spaces other than the white cubes of the art world. This year, in a little building on the site of Expo 2000 in Hanover, Marijke van Warmerdam presented her new film Lichte Stelle. Filmed from behind, it shows a little boy in swimming trunks, standing in front of a lake. This calm, fairly static picture would be quite at home in a museum, probably too much at home. But in its little shelter on the terrain of the tawdry tourist funfair called Expo 2000, the picture functioned as a Fremdkörper, similar to the way in which the verdure of an oasis in the desert is experienced as being highly welcome but nonetheless out of place. Images that conform too readily to what is expected of them in a particular place, are liable to forfeit some of their impact; installed in locations where they are out of place, they might very well gain in strength. It could lead to an interesting comparison if Bantar Gebang, as well as being shown at Bureau Amsterdam, were to be screened in a small viewing room in Pathé Arena or some other multiplex cinema. Disappointed by the new Paul Verhoeven and queasy from all the popcorn, cinema-goers could whet their gaze on the counter-images of De Rijke / De Rooij. 1. I am basing myself here on an unpublished text by Lev Manovich, ‘Reality Media’. 2. For a recent reinterpretation of the work of the Lumière brothers, see Thomas Elsaesser, ‘Louis Lumière - the Cinema’s First Virtualist?’ in: Thomas Elsaesser and Kay Hoffman (eds), Cinema Futures: Cain, Abel or Cable, Amsterdam, Amsterdam University Press, 1998, pp. 45-61. 3. For an analysis of Rope, see Peter Wollen, ‘Rope: Three Hypotheses’ in: Richard Allen and S. Ishii Gonzalès (eds), Alfred Hitchcock: Centenary Essays, London, BFI Publishing, 1999, pp. 75-85. 4. Gilles Deleuze, Cinéma I: l’Image-temps, Paris, Les Éditions de Minuit, 1985, e.g. pp. 59-60. The presentation of de Rijke / de Rooij is part of the exhibition "For Real" at Stedelijk Museum Amsterdam.